Alquézar is a beautiful medieval village set amidst some of the most spectacular landscapes in Europe. Bellavista Apartments are the balcony from which to admire the breathtaking views. 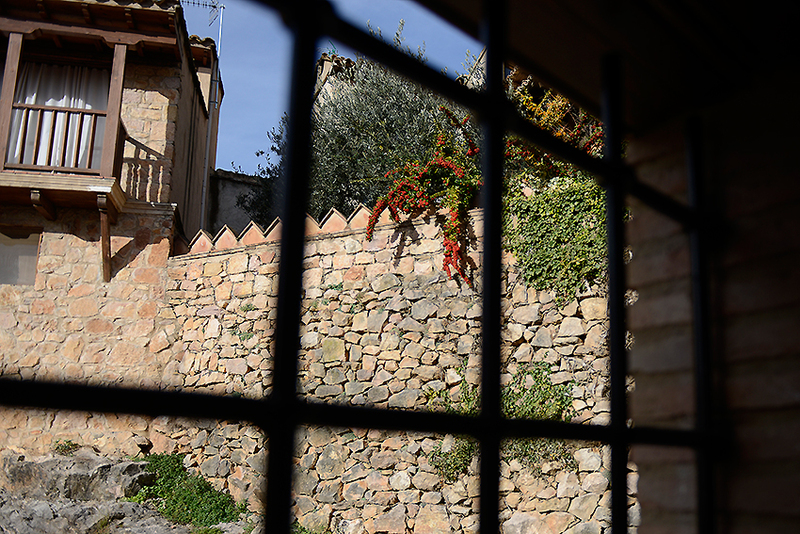 Our apartments are located at the entrance to the medieval village. This stately new construction (2009) with rustic stone and wood finishes is comprised by two individual and independent apartments identically distributed. Spacious, luminous apartments with impressive views of Alquézar and the surrounding environment. Bellavista rural apartments have a ground/first floor layout with independent main entrances. 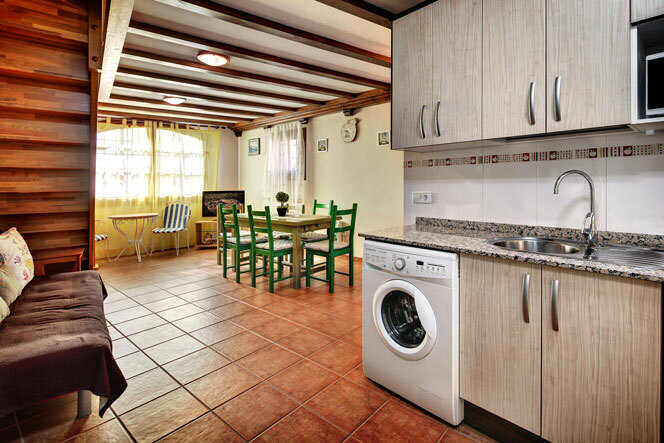 Both apartments are fully fitted with furniture, electrical heating system, television, washing machine, hairdryer and iron. The kitchen is equipped with a glass-ceramic hob, dishwasher, crockery, cutlery and all modern amenities to make your stay as comfortable as possible. All the bedrooms have bed linen and towels, including the sofa bed. 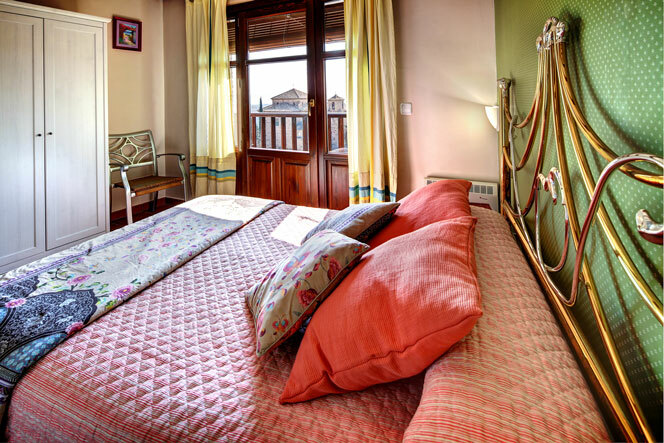 La Carrasca is an apartment for a maximum of 5 people distributed on two floors, with independent main entrance. It has magnificent views of the village of Alquézar. El Cachigo is also a 5-person apartment with an excellent location and views of our village. ROCK, WATER, HISTORY, LEGEND, PAST AND FUTURE, ADVENTURE AND CALM. Alquézar, castle, collegiate church and medieval village is perched atop the Vero River Canyon against a backdrop of rugged beauty that forms part of the Guara Sierra and Canyons Natural Park and Vero River Cultural Park. The apartments are located approximately 100 metres from the public car park (free). How to get to the apartments: When you arrive at St. Antón Hermitage you will see a roundabout, where you should take the first exit on the right (no entry except for loading/unloading and local residents). You should be able to see the village at this point. Shortly afterwards you will arrive at a court wall. The Bellavista Apartments are located at the top (next to the access stairs to the public car park). You can stop momentarily here to load and unload luggage and then park in any of the free public car parks in the village. Adventure sports: Alquézar is perched atop the Vero River Canyon, where a world-famous canoe descent takes places. In order to practice canoeing (suitable for the general public) and many other activities, we suggest you contact Guías Boira, who have kindly allowed us to use their photos in this section. Cultural tours: The Sierra de Guara mountains boast prehistoric rock art sites, declared Cultural Heritage of Mankind, and the entire region is sprinkled with beautiful buildings featuring styles ranging from Romanesque to Baroque and stunning monumental sites. Museums and visitor centres, routes, restored monuments, guided tours and a wide range of scheduled activities and events allow visitors to choose from a broad cultural tourism offering. For further information, visit the Somontano Region Tourism website. Wine tourism: The Somontano Region is famous for its Denomination of Origin wines. You can dedicate a day to visit one of its many wine cellars. For further information, visit enodestino. Alquézar, guided tour of the medieval village: main square, castle, collegiate church of St. Maria La Mayor, ethnological museum. Vero River Cultural Park, visit to prehistoric rock art sites (Arpan, Mallata, Barfaluy, Chimiachas) and fauna and flora visitor centres. Sierra de Guara and Canyons Natural Park: Vero River Lookout Point, Lecina Spring, ancient Kermes oak tree, Villacantal Bridge, Vero RiverPower Plant, Vera River Walkways Circuit, Basacol Natural Pool, Mascun River Valley. Guara Sierra and Canyons Visitor Centre in Bierge, Colungo Prehistoric Rock Art Centre, Adahuesca Legend and Tradition Visitor Centre. Colungo Prehistoric Rock Art Centre, Adahuesca Legend and Tradition Visitor Centre, Vero River Visitor Centre in Adahuesca. Mountain bike, all-terrain bile, rock climbing, multi-adventure, paintball, gastronomic tours, hiking-trekking, horseback riding, via ferrata, quad biking. Canyoneering: Anyone can practice this sport, as there are canyons and ravines for all levels. Somontano Denomination of Origin wine tasting and visits to the impressive modernist wine cellars. Fauna and flora observation workshops. Hiking: Wide range of trails through the Sierra de Guara and Somontano region, which are clearly sign-posted. For the general public and different distances. Alquézar Walkways route, Mesón de Sevil route, Chimiachas route. Bird watching: The Sierra de Guara mountain range is a privileged setting for bird watching, especially birds of prey such as bearded vultures, royal eagles, Egyptian vultures and griffon vultures, among others. Special events / Important dates. Here are some important dates for our village. If your visit coincides with any of them, in addition to enjoying the magnificent architecture and breathtaking landscapes you can also actively participate in our traditions. 6 January: Procession of the Magi. The Three Wise Men will visit our village loaded with presents for children from all the villages of the region. 17 January: Local festivity of St. Antón. Eggs and fry-up at St. Antón Hermitage and mass with wine and sweet cakes. 20 January: St. Fabian and St. Sebastian. Social gathering around a bonfire on the new street. Easter: Good Friday and Resurrection Sunday processions. 11 to 14 August: Festivity of St. Hipolito (major festivity). 8 November: Festivities in honour of St. Nicostrato (small festivity). *High season: Easter, July, August and national holidays . Off-season: rest of the year. In stays of 6 nights or longer, 1 night free of charge. Minimum 2-night stay. 15% one night surcharge. Current rates without intermediaries, booking by Apartamentos Bellavista. The apartments are open the year round. To confirm the reservation you must pay a deposit of 30% of the total price of the stay by bank transfer. The remaining amount shall be paid on arrival at the apartment in cash or by credit/debit card. Cot hire: €15 for the entire stay. El Cachigo Apartment: €10/night. In this case the sofa bed is only suitable for a child. It is not recommended for adults. Make your reservation here and we will reply as soon as possible. This form is not a confirmed reservation. We will contact you on receiving your request in order to confirm the reservation subject to availability. Thank you!We will contact you on receiving your request in order to confirm the reservation subject to availability.